AMONG THE pledges Shinzo Abe made in 2012, as he started his second stint as Japan’s prime minister, was to double the sales-tax rate. At 5% it was low by rich-country standards, and Japan’s public finances, battered by years of deficits, needed shoring up. But having gone part-way, to 8%, in 2014, he has twice put off finishing the job for fear of choking off a tentative economic recovery. That increase is now scheduled for October, and he is loth to delay a third time—so much so that he has said that only “an event with the magnitude of the Lehman Brothers shock” would deter him. Everyone agrees that a higher sales tax is needed, but they differ on the wisdom of a speedy move. The previous hike provoked a sharp downturn. Now fresh signs of economic weakness are leading to fears of a repetition. PROTONS POP up in every atom. Proton cars are not quite so ubiquitous. Founded in 1983 by Malaysia’s government, the Proton company strove to build a truly “national car”, but its parent lost over 1bn ringgit ($280m) in the two financial years before it sold a stake to Geely, a Chinese carmaker, in 2017. Neighbouring Thailand, in contrast, lacks a national car, but boasts a thriving car industry. Carmaking took off in the late 1980s after Japanese multinationals flocked to the country, importing whatever they could not make or buy within its borders. Foreign parts still account for 56% of the value of Thailand’s car exports, according to the most recent data from the World Trade Organisation (WTO). But the remaining home-grown value exceeds the total worth of Malaysia’s car exports several times over. NO ONE IS more aware of the value of a brand than Goldman Sachs. The investment bank, founded in 1869, has advised the biggest and best American companies on the value of theirs for the past 150 years. It helped F.W. Woolworth, a pioneering department store, with its initial public offering in 1912. It took Ford and Disney public in the 1950s, helped Amazon buy Whole Foods in 2017 and will take Uber public later this year. Yet these are troubled times for its own brand, tarnished by association with a fraud-ridden Malaysian state-run fund, 1MDB, and hurt by the bank’s failure to adapt after the global financial crisis. These issues were echoed in its first-quarter results, released on April 15th. Revenues came in below expectations—13% lower than for the first quarter of 2018—largely as a result of lower trading revenues. The share price fell by more than 3% and the earnings call was peppered with analysts asking questions about1MDB. AMERICA’S FINANCIAL markets made a stunning start to 2019. The S&P 500 stockmarket index climbed by 13.1% in the first quarter, its best beginning since 1998. But that was little use to Wall Street banks. Trading revenues depend on volumes, not prices. Quarterly earnings, reported in recent days, have confirmed that they were markedly lower than a year earlier. Never mind. The retail divisions of America’s mightiest banks did well enough to boost profits overall. The giants’ retail heft is likely to keep serving them well. Start, though, with the grim stuff. Share-trading revenues fell by 24%, year on year, at Citigroup and Goldman Sachs; by 22% at Bank of America (BofA); and by 13% at JPMorgan Chase. (Morgan Stanley, the remaining bulge-bracket Wall Street firm, was due to report earnings after The Economist went to press on April 17th.) New share issues were delayed by a 35-day government shutdown that lasted until late January, holding up approvals at the Securities and Exchange Commission; equity-underwriting revenues tumbled by 20% at Citi, 23% at JPMorgan Chase, 29% at BofA and 34% at Goldman. But debt underwriting was perkier at Citi and JPMorgan Chase, and advisory fees rose across the board. JUST OVER 25 years ago Shanghai launched its metro with a single, stubby line. Since then it has added 15 lines and some 700km, making it the world’s longest metro system. It is far from done. The city recently unveiled plans for another 300km, including overland rail, within five years. 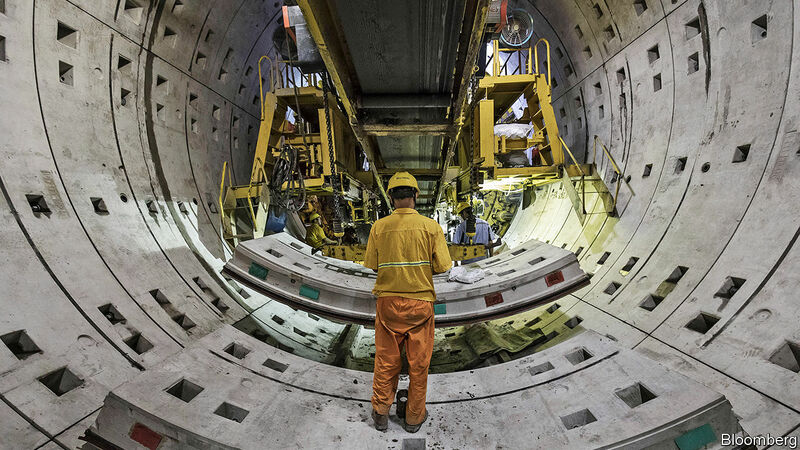 Much of the work proceeds unseen as machines bore tunnels beneath the surface. But excavation holes around the city offer clues about the activity deep underground. They are part of a nationwide push. The Chinese government has, in the words of state media, hit the “fast-forward button” on infrastructure spending, a tried and tested way to pep up the economy. In the first quarter China’s GDP grew by 6.4% compared with a year earlier, level with the final quarter of 2018—its slowest in a decade. That would still be enviably fast for most countries. But Chinese officials have been unnerved by the possibility that it could herald the start of a steeper slide. FOR CENTURIES prior to the Industrial Revolution, Asia’s massively populous societies made the continent the world’s centre of economic gravity. Industrialisation in Europe and North America in the 19th century briefly knocked it from its perch. But now their collective economic might, measured in real output on a purchasing-power-parity basis, is forecast to account for more than half of global production by 2020. Was the West’s period of dominance an anomaly, which could only ever have been short-lived? Is population destiny? It stands to reason that countries with larger populations might enjoy long-run economic advantages. People are the raw material of economic growth, after all. The more there are, the greater the likelihood that one becomes a Gutenberg or a Watt. In a world without much international trade, populous countries offer the largest markets, and comparatively more opportunity to boost economic output through specialisation and trade. Projecting economic growth rates is fantastically hard even over very short time horizons; over centuries, it is as good as impossible. But there are worse strategies than betting on the places with the most people. INDIA’S BANKS have a poor reputation—and for good reason. The state-controlled ones offer cheap credit to the well-connected, have piles of bad loans and are barely accountable. Nor are the private ones flawless. In the past year the bosses of two of the biggest left after concerns were expressed by the Reserve Bank of India: at Axis Bank because of credit problems and at Yes Bank because of governance worries. The head of the second-largest, ICICI, stepped down because of a scandal involving loans to a firm whose shareholder had dealings with her husband. In this dismal scene one bank, HDFC, consistently shines. In the coming days it is expected to announce the latest in a series of stellar performances. Profits are expected to be around 20% higher than last year. Return on assets is 1.8% and return on equity is around 17%—excellent for a bank. The share price is 286 times what it was in 1995, when the firm went public—and 132 times its 1995 level in dollars. The bank’s market value is over $90bn, and Goldman Sachs thinks that it could exceed $200bn by 2024. That would gain HDFC admittance to a global elite now made up of American and Chinese behemoths. WHEN HE WAS nominated to lead the World Bank by President Donald Trump, David Malpass, a former Treasury official, faced no rival for the position. He was approved unanimously by the bank’s board, which represents its 189 member governments, and began work promptly this week. The process could not have been easier. But stiffer resistance lies ahead. Chances are that nothing in the job will become him like the entering it. The institution he now leads is dedicated to eradicating poverty and fighting inequality. By its estimates, 10% of the world’s population (736m people) lived below the global poverty line in 2015 and perhaps 8.6% did in 2018. It aims to lower that share to 3% by 2030. THE WINDOW to submit applications for an H1B visa, a golden ticket for foreigners wishing to work in America, closed on April 5th. Soon the 85,000 winners will take up new jobs in the land of fresh starts. But those lucky few, most of them highly qualified, and many handsomely paid, will leave their credit histories at home, rendering them invisible to financial institutions. They will find it almost impossible to get a credit card, mortgage or any other type of loan. It is a difficulty that affects millions worldwide. In 2017 immigrants made up 17% of America’s civilian workforce. Despite having free movement of labour as one of its core principles, the European Union has no system for transferring credit records across its internal borders. Banks suffer, too, missing out on potentially lucrative customers. THE HEADQUARTERS of the European Central Bank (ECB) tower over the river Main. The institution has been equally imposing in the life of Europe’s monetary union. As its only policymaker, it rescued the euro from financial and sovereign-debt crises, and powered a recovery in 2015-17. But it cannot rest on its laurels. This year promises to be one of high drama. Three of its six-strong executive board will depart, notably its president, Mario Draghi, and its chief economist, Peter Praet (see graphic). By the end of the year eight of the 19 national central-bank governors on its rate-setting body will have stepped down. The end of Mr Draghi’s eight-year tenure coincides with European elections and the top jobs in Brussels coming up for grabs. That makes the choice to replace him unusually political. Should their quest for the commission or council presidencies fail, the French or Germans could seek to put a compatriot—or in the Germans’ case another hawkish northerner—into the ECB job as a consolation prize. All this could alter the course of monetary policy. Poor choices could mean blunders in dealing with a slowing economy or too-low inflation. The bank’s hard-won credibility as the guardian of the euro could come under threat. THERE ARE more than a few echoes of the Nixon era in the presidency of Donald Trump. Monetary reverberations are among them. Facing re-election in 1972, Richard Nixon felt he needed a strong economy at his back, and made a habit of haranguing Arthur Burns, the chairman of the Federal Reserve at the time. Burns recounted the meetings in his diaries: “The president looked wild; talked like a desperate man; fulminated with hatred against the press; took some of us to task…” Historians reckon Burns was too accommodating of Nixon’s demands, and so helped launch the inflation of the 1970s. Mr Trump is now waging his own assault on the Fed’s independence. He has repeatedly complained about the central bank’s decisions and urged it to take a more doveish stance. More strikingly Mr Trump, who has already chosen three of the five sitting members of the Fed’s board of governors, has named Stephen Moore and Herman Cain to fill the remaining two vacancies. In contrast to candidates who have come before, both are political activists. But the parallel with the 1970s is less apt than it seems. There are different ways to politicise monetary policy, and Mr Trump’s is particularly poisonous. JAMES M. CAIN’S novel “The Postman Always Rings Twice” portrays a violent love affair between Frank Chambers, a drifter, and Cora Papadakis, a former beauty queen now married to a man she despises. Their romance is doomed from the beginning. Every attempt to find happiness fails. Any attempt at being apart is equally hopeless. “Why did you have to come back?” she hisses after one break-up. “I had to, that’s all,” he replies. The story comes to mind when contemplating the fate of the managers of the world’s $11trn-worth of foreign-exchange reserves. This is not to say they are obsessives wracked with guilt and paranoia (though a few might be). But rather that, like Frank and Cora, it has probably occurred to them that their dominant relationship, which is with the dollar, may not be entirely good for them. The latest figures from the IMF show that the share of dollars in global reserves fell to 62% at the end of last year. Reserve managers seem to be for a cooler, less intense affair with the dollar. But eventually, they will find that it is hard to break free. That is not so much because the alternatives to the dollar have flaws (though they do); rather, it is because the pain of a weaker dollar will become too much to bear. FOR MIGRANT workers, sending money home is an expensive chore. They send plenty: remittances to developing countries are set to reach $550bn this year, beating foreign direct investment, the World Bank said on April 8th. Total cross-border transfers to and from individuals and small businesses come to $10trn a year. But a hefty chunk is taken in fees along the way. American high-street banks can charge over 5% for smallish transfers between major currencies. MoneyGram, an established money-transfer giant, levies 5% for the hop from Britain (sterling) to Ireland (euros). Fees for minor currencies are swingeing. Wiring $200 from South Africa to Nigeria can take days, and costs over 25%. Cash transfers are even worse value. Now some fintechs are trying to disrupt the cosy status quo. In a world made smaller by Skype and instant messaging, “why does money still go on a donkey?” asks Taavet Hinrikus of TransferWise, a London-based fintech that typically charges a tenth as much as British banks. As yet the newcomers have merely nibbled around the edges. But as incumbents abandon tricky markets, technology improves and financial regulators take aim at unclear pricing, they look set to take a bigger bite. PESSIMISM ABOUT the world economy has grown throughout 2019. Disappointing data, tumbling bond yields, the trade war between China and America and political crisis in Britain have all played a part. The only bright spot has been mostly buoyant stockmarkets. On April 9th the IMF will probably report a downgrade to its forecast for global growth this year, which in January stood at 3.5%. But there has so far been only a deceleration, not a downturn, because economic weakness has been contained mostly to manufacturing, rather than afflicting the service sector (see chart). And a manufacturing rebound might soon lift the global mood. THE PUBLICATION six years ago of Thomas Piketty’s “Capital in the Twenty-First Century”—an 800-page tome that has since sold over 2.5m copies—helped reveal the huge increase in inequality in the West since the 1970s. So why has support for welfare spending to counteract it remained so stable over that period? In theory, support for redistribution should increase with the gap between rich and poor, as the envy of the have-nots is stoked. But polls in America and Britain suggest virtually no growth in support for redistribution since 1980. A new paper* due to be presented on April 7th at the Economic History Society’s annual conference suggests an interesting answer. Rather than the gap between rich and poor being the main influence on attitudes to welfare, the degree of inequality within the upper classes might matter more. IN 1980, IN his early 20s, Mengistu Maregne began selling soft drinks from a stall in Merkato, Ethiopia’s largest market. To finance the fledgling business he joined an ekub, a rotating savings-and-credit association (ROSCA) that pools contributions from members each week and disburses the pot to the winner of a lottery, with each member winning once over the scheme’s term. Being first to draw the lump sum of 4,000 birr ($140), he put the money away and joined another. Within a year he had bought a home; soon after he bought a shoe shop. “Ekub changed my life,” he says. Though ROSCAs are found across the developing world they are often assumed to serve the poor. But Ethiopia’s are used across the income scale. They encourage members to save, and enable some to raise business capital or buy pricey items such as cars. Some have hundreds of members, with officers who vet applicants and analyse risks. “IT’S LIKE the Midas effect in reverse,” says Badiul Majumdar of SHUJAN, an anti-corruption pressure group. “Everything the government touches turns not to gold, but rather from gold to dust.” He is talking about Islami Bank Bangladesh, which was rocked in 2017 when the government sent military-intelligence operatives to force out senior executives and board members, and replaced them with figures more to its liking. Fears that the boardroom coup would drag down a comparatively well-managed institution in a sector marred by political meddling and cronyism now appear to have been justified. Established in 1983 as Bangladesh’s first bank run on Islamic principles, Islami thrived by handling a large share of remittances from emigrant workers and by lending to the booming garment industry. Its troubles stem from its links with Jamaat-e-Islami, Bangladesh’s largest Islamist party, which allied with Pakistan during the war of succession of 1971. One of the first acts of the current prime minister, Sheikh Hasina Wajed, after taking office in 2009 was to set up a court to try war crimes. Leading figures from the Jamaat were sentenced to imprisonment or hanging. IT’S NOT all bad. In 2008 Lloyds, a large British bank, took over HBOS, a rival that was being sucked beneath the rising waters of the global financial crisis. HBOS nearly dragged Lloyds under with it; £20.3bn (then about $30bn) of public money was needed to keep the combined group afloat. But these days Lloyds is doing all right. Under António Horta-Osório, its chief executive since 2011, Lloyds has ditched almost all its foreign operations, narrowed its product range and (like many other banks) poured money into digitisation. The state sold its last shares in 2017. Last year the bank’s return on tangible equity (ROTE), a measure of profitability, was a decent 11.7%. This year Mr Horta-Osório is aiming for 14-15%, Brexit notwithstanding.